Christmas is more than just the snowy night sky and the melodious Christmas songs, it includes a little bit of worries - what Christmas gifts to buy for people around you for the festival? Sometimes too many gift options might confuse people and they fail to impress the recipients although they put a lot of consideration to the gifts. Is there any gift that is decent and well thought as well as showing courtesy to the recipients? The answer is YES. Today, Hong Kong Give Gift Bouquet Flower Shop is going to introduce a practical gift for our readers- the Gift Basket / Gift Hamper. From firework gifts that represent childhood memories to snack boxes that are popular on the Internet right now, these kinds of gift packs bring joy to numerous people. When you unwrap a gift basket, you get a bigger surprise than opening a single gift. Imagine that, each one of the gifts you take out from the gift basket is a surprise, you never know what you’re gonna get next, so the process of revealing each gift already brings you continuous happiness, not to mention the beautiful gift itself. That’s why sending gift hampers is always a trend on the happy holidays. 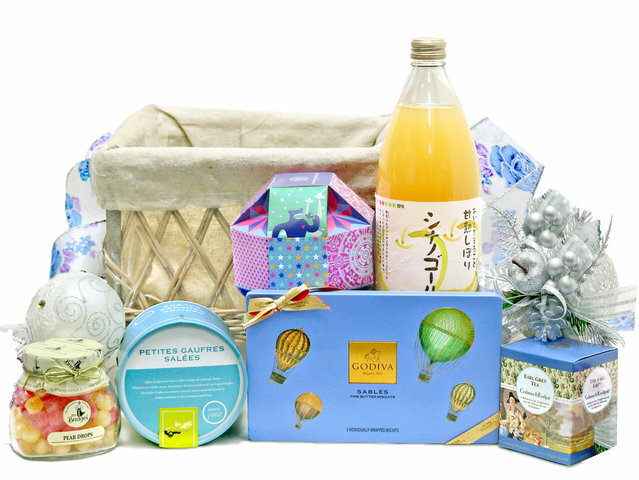 Regarding the production of gift hampers and gift baskets, the gift industry has been focusing on the collection of high-quality brand products around the world and researching for the innovate packaging design as well as the creative gift combination. 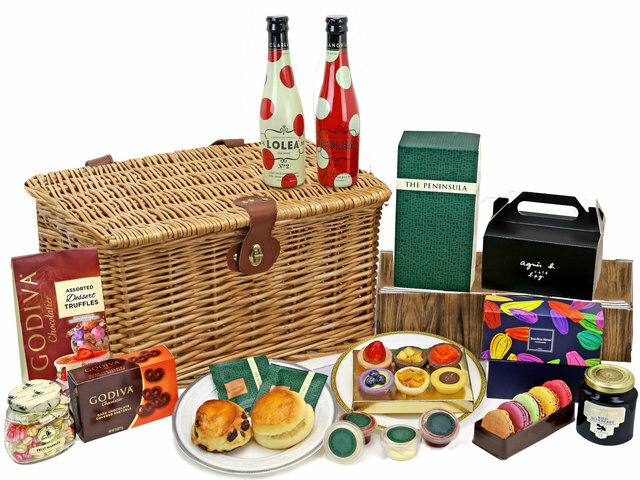 A well-made gift hamper includes imported fruits, brand-name cookies, chocolate, desserts, candies and fruit juice, etc. from all over the globe; it is also packed in an exquisite gift basket with nice packaging which delights the recipients when they receive the gift. Gift shops nowadays not only strive to increase the gift diversity of their gift hampers, but also try to make them more seasonal. Gift packaging colors, decorations and patterns change according to different festival seasons. The Christmas gift baskets are sacred and warm with classic red, white and green colors; the newborn baby gift baskets use refreshing and lovely color tone; gift baskets for traditional festivals such as the Mid-Autumn Festival and the Spring Festival are mainly in red tone so as to match the delightful festive atmosphere. 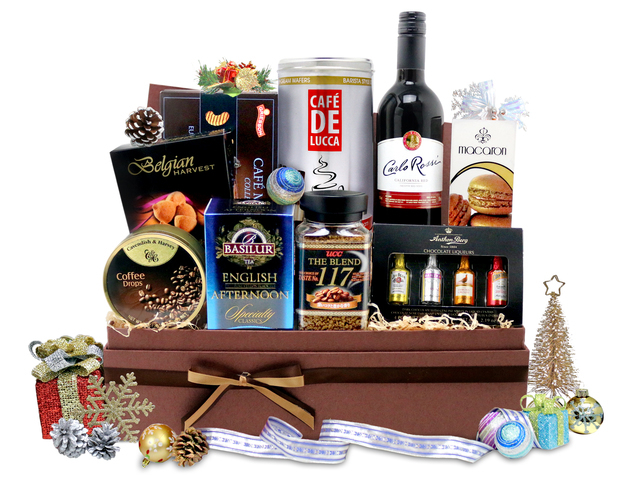 Therefore, the highlights of a gift basket are the beautiful packaging and the abundant gifts items. A thoughtful gift basket can add rich festive atmosphere to the special day. Christmas is coming soon; do you have any ideas what gift to give for Christmas? What kind of Christmas gift basket is suitable for different recipients? Although gift baskets vary, they convey the same message of love and care to all sorts of important people in your life. Because of the gift diversity and seasonal changes, gift baskets are considered the best messenger to express your emotions to the recipients and are used in different gift giving occasions. In addition, some gift companies also offer personalized gift services for customers to customize their own gift baskets, which means they can create their customized gift hampers with their favorite gifts combine together. As Christmas is around the corner, why not choose a well-thought-out gift basket to send to your family, significant other, colleagues and friends you care about. This is a Hong Kong GGB original 'What Gifts are Suitable for Christmas? The Best Practical Gift Ideas' blogpost.